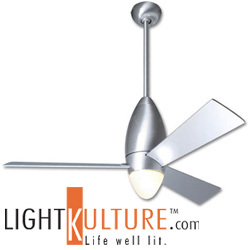 LightKulture.com a leader in contemporary lighting fixtures and ceiling fans is pleased to offer Ron Rezek’s Modern Fan Company. The new DC Slim takes advantage of direct current motor efficiency, using only 25 watts of electricity to generate over 6200 cubic feet per minute of air. LightKulture.com is pleased to offer Ron Rezek’s Modern Fan Company. “The Modern Fan Co. is the original source for contemporary ceiling fan design,” noted Susan Inderbinen President of Lightkulture.com. Ron Rezek has produced the most complete, exclusive modern collection of ceiling fans. The product line honors the disciplines of modern design through mechanical simplification, geometric forms and contemporary finishes. Modern Fan Co. is produced to meet the needs of the professional designer, but also for the designed-minded homeowner. In 1986, Ron Rezek was approached with the idea of updating the 100 year old ceiling fan. He recognized the opportunity to introduce contemporary design to this necessary category. As an accomplished industrial designer of lighting and furniture, Mr Rezek was up for the challenge. The Stratos fan was the first evolution in ceiling fan design that is still celebrated for its sophisticated and timeless originality. The goal of Modern Fan Company’s product introductions is to remain above fashion and trends, and to continually provide products that are artfully and technically appealing. These ceiling fans will be as relevant years from now as they are today. These ceiling fans not only capture the look and feel of quality production, they actually do the job of re-circulating air, adding comfort to your surroundings. This cooling effect allows for an upward adjustment of your AC thermostat by as much as 8 degrees. This can result in a savings of up to 40% in power consumption. In many cases, Modern Fans use less electricity than a standard light bulb. The new DC Slim takes advantage of direct current motor efficiency, using only 25 watts of electricity to generate over 6200 cubic feet per minute of air at high speed, This is almost 1/3 less energy consumption of other well know ceiling fans brands. Combined with an 18 watt energy saving fluorescent lamp, this direct current fan is one of the most economical ceiling fans with lights on the market today. “We are so pleased with Modern Fan Co. It is a pleasure to sell well made, quality products that makes sense, are easy to use and are so complimentary to any space. Not only are Modern Fan Co. fans designed to stand the test of relevant design, they add a level of comfort in summer and winter, as well offering functional ambient lighting to any area they are installed. In the forward setting, these energy efficient fans can help significantly reduce your utility bills by enabling you to set your thermostat higher while enjoying the cool breeze of the fan. In the winter, set the fan in reverse to bring the warm air trapped in the ceiling, down to the living area. The new DC Slim model is so sleek and elegant, but also only uses 25 watts of electricity. That is practically unheard of for a ceiling fan with lights. The 18 watt GU 24 fluorescent lamp is color corrected, but it is not dimmable. You can multiply the lamp wattage by 4 to estimate the comparable incandescent light output. These fans generally function well as the primary light source in any space, this will depend on many factors such as room size, ceiling height, room color, and the intended use of the space” noted Susan.